Activities, Books, Crafts and Snacks for Early Literacy and Family Fun! When I am responsible for the weekly programs, I try to pick a topic that can be tweaked easily ~ that way I can change things up for the little ones ~ who tend to be younger for our daytime storytimes and a little older for our night one. Besides our Mother's Day topic, which we did last week, I have chosen to do a Farm theme. It is such a versatile and fun topic for all ages! Plus I already have tons of flannel sets, magnetic board sets, songs, fingerplays, puppets, etc. ~ and the list of books to choose from is endless and awesome! For Flannel Friday this week, I want to share one of my oldest ideas for a storytime prop. I made my first one years ago when my own boys were little and we were going to visit my Dad who was a veterinarian who cared for many types of farm animals in rural Oklahoma. It was a perfect way to connect our trip to our chosen library books for that week. My boys loved chosing library books by topic when they were little! They especially loved choosing animal books! I then used this storytime prop in my classroom for many years! Who's inside our Big Red Barn? This Big Red Barn is about 1 ft by 1 ft. It is made from very sturdy posterboard and held together by a paper fastener. The yellow ﻿﻿circle spins so, that each time you open the barn doors, you will see a different farm animal. The little ones LOVE the surprise of not knowing which animal they will see next! As I mentioned earlier, this storytime prop can be used for lots of activities. I often use it with the song, Old McDonald Had a Farm. Pig ~ "Oink, oink, oink!" Sheep ~ "Baa, baa, baa!" Horse ~ "Neigh, neigh, neigh! 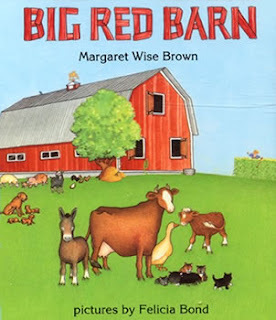 If you make your own Big Red Barn Storytime Prop, you can choose different animals for your "wheel". I actually have a second "wheel" with different animals on it that I can switch out very easily. If I have older storytime friends who want to sing about more animals, I have been known to switch the "wheels" right there in front of them. It is that easy! Also, keep an eye out on the blog for another Blog Hop. It will be a Farm ABC'S Blog Hop! Coming your way soon! (one of my favorite children's book illustrators! And I hope ya'll will have lots of fun with your child/ren if you get a chance to visit a Farm to see all of the animals in the Big Red Barn! This week, our Flannel Friday Round-Up is being hosted by Linda at Notes from the Story Room.﻿ Thank you, Linda, for doing the round-up! This is very cute! The barn is so cheerful. Thank you, Anne! It is really nice to hear from you! This is soooo clever. I never thought of doing this. Wow...my head is spinning right now. Somany ideas!! Thanks! Thanks, Jane! I would love to hear about your ideas. :o) I have some more "spinning wheel" ideas that I will be sharing on the blog soon. It will be interesting to compare ideas, I think. You are always so creative! This is such a cute idea - LOVE it! I visited your blog and I especially love your Friday posts. I am looking forward to visiting again and taking some time to explore your posts. I hope you will take a look at my Blog Hops and linkup any of your posts that you want to share on the Blog Hop's topic. My 7 yr old would love to see this. I bet you are enjoying your job, children can be fun...and hard work too. Following on GFC and NetworkedBlogs from thr SWB hop. Hi, Ugochi! Thank you so much for taking the time to leave a comment and also for the follows. Thanks for stopping by for a visit, Clairejustine. And I appreciate the follower. I hope you will enjoy future posts! Thank you, Andrea, for your kind comment. I would love to see your version when you make it. Let me know if you have any questions, okay? This is so cute! Thanks for sharing! Thank you for stopping by and linking up to the Weekend Inspirational Blog Hop! I was already following on GFC, however; now following on Network Blogs. Have a wonderful Sunday!!! Thanks for the follows, Jenelle! I hope you will visit again soon! a very fun theme..the kids will have fun while they learn...the best way to learn!! It will be fun to read your blog posts because I am from a family of 7 children. It will be fun to see if your post brings back memories of being from a large family. LOL I love having so many brothers and sisters! Cute! Newest follower. Hope you stop by and follow back. Hi The Girl in the Wild West! I hope you are enjoying your evening! New follow from the blog hop! Hope you get a chance to stop by my blog. Wow - such a great idea. I LOVE that prop. Thanks so much for sharing. I'm glad you linked up at Romance on a Dime. I hope to see you back next Tuesday. I'm pinning this. I have you blog hop/linky party in my Weekly Blog Hop list and I am hoping to link up again next week. I love doing the linkups because it is exciting and fun to visit other blogs and to have other bloggers stop by to visit and comment. I'm going to make this for my son! We'll be doing a farm theme for school in the Fall again this year. I am so excited to hear that you are making one for your son. :o) I hope you both have lots of fun with it! I am working on a blog post with instructions on how to make the Storytime Craft size. I will have templates available soon. Just email me if you are interested in having them and I will send them to you as soon as they are ready. You are so welcome! And thanks for following me back. :o) I hope you will enjoy my upcoming posts. I am certainly looking forward to reading yours. It is so fun to find new blooger friends! LM*O! You gotta love autocorrect! Is "blooger" even a word? :o} I meant "blogger" friends. I would love to hear from you and will do my best to help you in anyway that I can. Enjoy your baby! Sixteen months is such an awesome age. I really like the Big Red Barn book. Thanks for sharing that fun story prop. I will have to keep this in mind the next time I read it. New Follower! I would love for you to come by and share this post on the Creative Corner Hop. The linky party starts on Monday and stays open all week. Adorable story prop for the little ones. I will pass it along to our MOPS group. That's a great idea to ad some extra fun to storytime. Thanks for sharing it with us at the Kids Co-op. That was so cute and entertaining for the kids.. Thanks for joining/linking up to Color Connection last week, the linky is up now for this week. Hope you can join again. PS.. Please use the badge of the meme in your post so others could join too, thanks! We will be doing a farm unit here soon. Is their a template? or did you freehand this. I love it. My kiddos love anything animals. I'm sorry should be more specific. I'm looking for the barn. I am in no way an artist so need all the help I can get, lol. 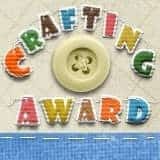 Craft Corners recognizes Storytime ABC's! My very first blog award! Whoo hoo! Hi! I am so excited to be starting this blog because I am one of THOSE grownups who is lucky enough to "PLAY" for a living. I spend my days with young children and their caring adults at our local library. I LOVE my job! <3 I love sharing fun learning activities, quality children's books, and creative craft ideas that promote literacy and family togetherness. I have so much fun planning and presenting my storytimes that I just have to share the FUN with you! This blog will be a place for me to organize myself a little more and to, hopefully, entice you and your child to engage in some "educational entertainment" and, more importantly, to entice you to read, read, READ together! Please visit this blog often for new posts. See you around! Flannel Friday: Oh, Lovely Mud! Flannel Friday: My Mommy Is Special! Flannel Friday: Let's Go on a Bug Hunt!